A new French law, effective from 1st July, (see February news) requires every car in France to contain at least one single use breathaylser at all times. Effectively, that means carrying at least two because if you only have one, test yourself clear, then drive away you will no longer have a beathalyser in your car. standards authority the Norme Francais and carrying the blue and white NF kite mark will be accepted by the Gendarmerie. Alcosense makes excellent muti use breathalysers, but because they don;t comply the company has been forced to offer single use 'breath bag' kits called Alcosense Singles in packs of two. You should be able to get them at ports of embarcation, but already this year the shops at ports have run out. So if you are planning a trip incolving driving in France the smart thing to do is buy some 'breath bag' kits before you go. 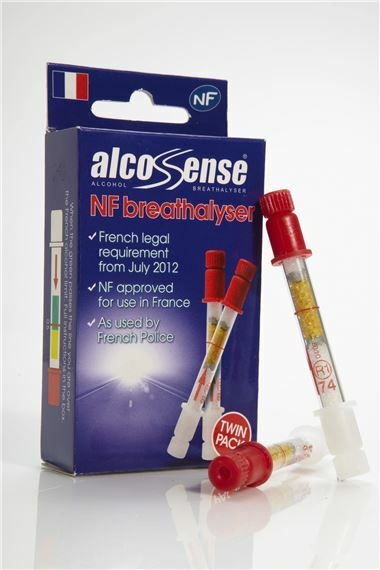 The AlcoSense Singles NF was specifically developed for the French market. They are on sale across the UK at branches of Halfords or direct from AlcoSense at Alcosense Singles and are also being sold by leading motoring organisations such as the AA, RAC and IAM.